"This edition of the ZimmCast features a couple of interviews from the AgCareers.com 2011 Ag HR Roundtable held last week in West Lafayette, Indiana where social media in the spotlight – like it is everywhere! One of the featured speakers at the event was Eve Mayer Orsburn, CEO of Social Media Delivered, one of the largest social media optimization companies in the world. Eve has developed this multi-national company in just three years, serving clients like GM and Sheraton with consulting, training and managing their social media services. Eve also hosts a weekly radio show called “Social Media for the CEO” and is author of a book by the same name. 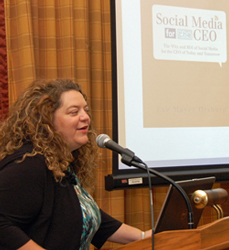 Oct 27 Eve Mayer Orsburn's new book 'Social Media for the CEO' reveals secrets to growing business through social media.